Here are the burning questions that our blog visitors want answered most. Every Friday for the last two years, we’ve been answering reader questions in our Friday Q&A series. Today, we’re featuring the top ten questions⁠—the ones that get the most traffic⁠—from the whole series. These are the burning questions that our metrics show continue to be big challenges for entrepreneurs, and I hope that you can get some value out of my answers to them. How to Get Press Coverage for Your Startup? What’s One Thing Most Entrepreneurs Should be Doing, but Aren’t? How Do You Hire Your First Programmer? How to Start Marketing From Scratch? How Do You Manage Your Trello Boards? What Should You Write About When You Have Two Very Different Audiences? I Need Someone to Sell My Product. What Do I Do? Should I Quit My Job to Pursue My Startup Idea? 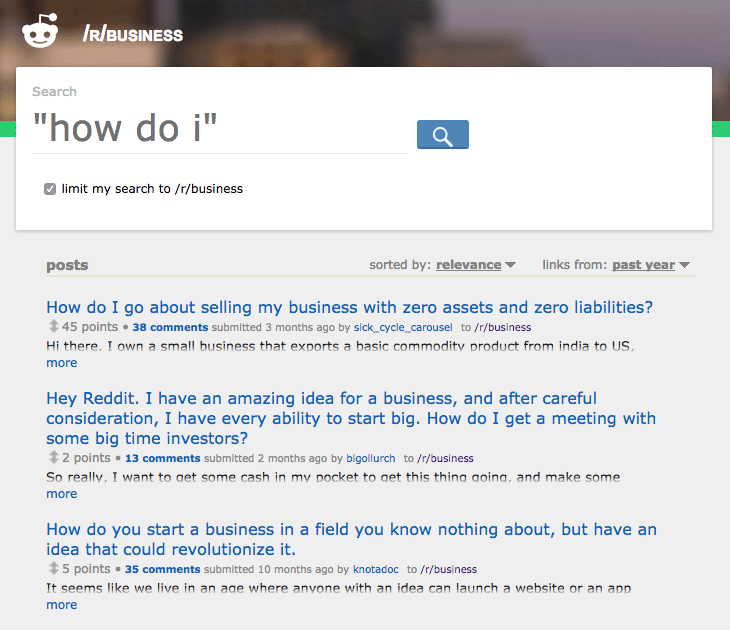 1) How Do You Come Up With Business Ideas? First, a caveat: I don’t need to tell anyone that building a business is really, really hard. That’s obvious. But in my experience⁠—and based on what I’ve learned from other founders I’ve spoken with⁠—it’s even harder to build a business when you’re not scratching your own itch. Ultimately, it’s that passion for solving my own problem that keeps me going through the lowest of the lows, and I know that many other founders feel the same way. With that said, there are plenty of founders whose passion is simply for solving problems for people, whether they share those problems or not. And if that’s your goal, I support you 100%, and I do think you have just as strong of a shot as someone filling their own hole. In fact, many of the business ideas I’ve added to my own list over the years have come from other people sharing their frustrations with me about something in their lives (and not mine). 1) Start paying attention **very deeply. In customer development, perhaps the biggest mistake that I made in the beginning was letting my assumptions take priority over my ears. Here’s what I mean: I’d go into interactions with assumptions about who the person was, what they wanted, what they didn’t want, and what their challenges and goals were. I’d listen to what they said, but I was only really listening for things that would either prove or disprove my assumptions, rather than listening to everything and trying to understand what was truly important. For example, I’d assume that the customer wanted a live chat feature. After the conversation, I could only tell you whether that assumption was correct or incorrect. What I couldn’t tell you⁠—until I started actively listening better⁠—was that some of the offhand comments that the customer made were very clear indicators that perhaps chat wasn’t even that important to them compared to, say, a knowledge base. When you begin to listen more actively, you begin to hear the little things that people complain about, often in the form of comments that seem like throwaways at the time, but actually indicate burning pains that need solving. These conversations, whether with prospects, co‑workers, friends or just about anyone else, can become huge sources of business ideas. 2) Search proactively for people looking for solutions. Another thing that I’ve seen work for some⁠—it’s a tactic that we sometimes use to source blog post ideas⁠—is searching online communities for problems that people are facing. You can get great ideas by running searches like this on reddit, Twitter, or just about any community where a target market might congregate online. 2) How to Get Press Coverage for Your Startup? They’re usually regular people who get a lot of email and requests for their time and attention. That means that a relationship-building strategy based on actually building value for them will instantly set you apart from the 99% of emailers who simply ask for free advertising. Follow this influencer outreach strategy, and create value. Give them tips on stories that have nothing to do with your business. Give them insightful feedback on their work. Make introductions to people who you know that they would value. When it’s time to ask for a favor, you’ll be in a much better position. No journalist’s goal is to write a love letter to your business, or to give you coverage. Think about how you can align your goals with theirs. Your business itself isn’t interesting to anyone but you. But maybe there’s a story you can tell that also positions your business in the right light? Don’t pitch your business. Pitch a story. The story of Groove isn’t that we’re a tool that helps businesses manage their customer service messages. The story of Groove is that most customer service software is far too bloated, clunky and expensive, and that creates a big burden on small businesses. That burden leads to long resolution times, low team morale and frustrated customers. Groove is one way to solve that problem. The second story is a lot more interesting than the first. You’ll likely create lots of different stories before one of them sticks. Don’t pitch an angle 50 times hoping that someone will bite. Test your approach, test your messaging and keep improving. Eventually, you’ll win. But the most important thing to know is that getting press coverage is not a transaction where you email a reporter and get a story. It’s a long-term strategy that, if you want to succeed at, you have to commit to. One final caveat: press coverage is NOT the sole growth strategy to pursue for most businesses. It can help you grow if the outlet’s readership aligns well with your own market, but getting covered in the press, in many cases, will do a lot more for your ego than for your business… and that’s dangerously addicting. That’s not to say that there’s not tremendous value potential here. Businesses that have thoughtfully-crafted, effective and consistent PR strategies can achieve great results. But the goal should always be growth. Not coverage. 3) What’s One Thing Most Entrepreneurs Should be Doing, but Aren’t? So many of us, especially without marketing backgrounds, assume that marketing is about telling people your story. That it’s about selling. Convincing. And it is about those things, but that assumption often causes us to overlook the MOST important part of marketing that far too few companies practice: listening. Unless you listen to your customers very closely⁠—long before you try to sell them anything⁠—you’ll never understand the right way to sell your product. Ask your customers a lot of open-ended questions. Learn about their needs and challenges, their fears and hopes. Do a ton of customer development. And then⁠—but not before⁠—carefully consider and act on what you learn. 4) How Do You Hire Your First Programmer? I had been a product guy for my entire career, working side-by-side with developers, so I had a bit of helpful experience when it came to actually hiring one, though we’ve certainly had our stumbles along the way. Get comfortable⁠—and good at⁠—selling. You’re not just selling to customers; convincing a technical co-founder to invest in chasing your dream (and making it their dream, too) is one of the hardest sales you’ll ever have to make. A couple of my favorite books that helped me do just that are Neil Rackham’s SPIN Selling and Yes! by Noah Goldstein, Steve J. Martin and Robert Cialdini. Consider hiring a developer on a project basis. It’ll save you money and equity in the short-term, and you’ll be able to validate your product as you iterate, little by little. Once you have that validation, it’s a lot more likely that that same developer (or another one) will want to join the team. If you can swing it, consider hiring an agency to build your prototype. There are pros and cons to this, but it’ll certainly help you get something built. Just make sure to start customer development a lot sooner than we did. In terms of feeling out whether the developer will be a good developer, this will take some trial and error, but I would absolutely ask for examples of past projects and references, and then contact each of their references and ask them the questions that are bugging you. Ideally they’ll have references that are non-technical, too, so you can get a good sense of what they’re like to work with from a perspective that’s similar to your own. 5) How to Start Marketing From Scratch? It’s always easy to answer a question like this after you’ve already figured out something that works well for you. So of course, if I knew then what I know now, I’d be doing all of the stuff that ended up delivering huge marketing breakthroughs for us over the course of Groove’s history. Deep, deep customer development. Before we did anything, I’d spend many, many hours talking to as many customers as possible, learning about their pains, challenges and goals, and thinking about how we could use our marketing to help them accomplish those goals (not to mention using these insights to drive our product development). As a result, the team had a strong launch and signed up a lot of users, fast. Drive top, middle and bottom-of-the-funnel traffic to our site. We didn’t launch our support blog until nearly a year after our startup journey blog launched, and already it has nearly caught up in terms of traffic (and gets more customer signups). Both blogs deliver tremendous value to us, and I’d make sure that we get them both launched from the beginning. Understand and embrace the power of SEO to drive organic traffic. It took me a while to get over my fear of SEO and realize that it’s not just some scammy tactic. Now that we’re taking it seriously, our traffic has never been higher. I regret not putting in the effort from the beginning. Influencer outreach is the reason that our startup journey blog has been as successful as it has been. Especially early on, our outreach campaign gave the blog the boost it needed to build a baseline of traffic that has been steadily growing ever since. We still use many of the same tactics for a lot of our marketing initiatives, and if I understood its usefulness when we launched the business, we’d be in a different place today. 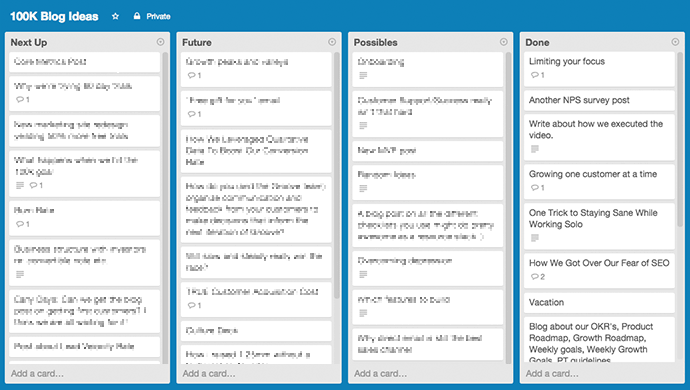 6) How Do You Manage Your Trello Boards? Oh man, do I know this pain. This is something we did a lot of tinkering with to get right, but we’ve finally settled on a system that works without being too overwhelming. 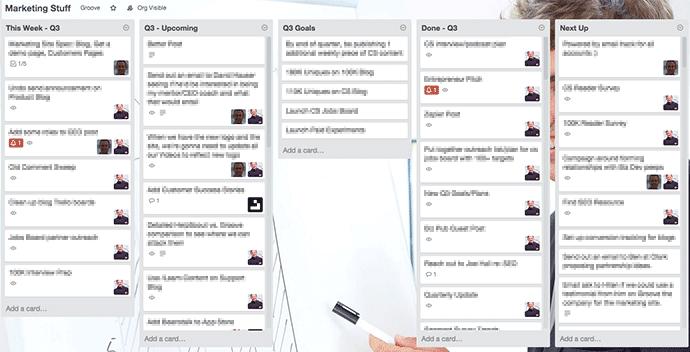 The team Trello boards are where we put weekly and upcoming to-do’s, as well as quarterly goals (as well as stash ideas for the following quarter). Every Monday, team leaders (or team members) pull to-do cards from Upcoming (and from our project boards) to This Week, so a team member’s respective board (or their team’s board) is the only board that they need to check on a day-to-day basis to see what they should be doing. These boards aren’t meant to be immediately actionable (e.g., you shouldn’t be checking these boards to see what to do next), but are meant to update when you make progress on something, or to grab to-do’s from for the coming week. 7) What Should You Write About When You Have Two Very Different Audiences? This is a great question, because it gets at an interesting challenge: content marketing success comes from writing posts that your audience feels was written just for them. But how can you accomplish that when you’re a two-sided platform and have two totally distinct audiences? Groove isn’t a platform, but we do have experience publishing for two different audiences. Our Startup Journey blog speaks very specifically to entrepreneurs and others responsible for growing their business. Our Customer Support Blog targets people responsible for customer service and success. There is some overlap, but not overwhelmingly so; we still see different things working (or not working) depending on the blog. This approach has worked really well for us. My advice⁠—although again, I’m not exactly in your shoes⁠—would be to split your content that way, with separate blogs for each audience. Separate lists, separate editorial calendars. A personalized, relevant experience for every reader. If you don’t have the bandwidth for this, then pick the side that’s most valuable to your platform (often one side influences the other more when it comes to signups) and attack that. 8) I Need Someone to Sell My Product. What Do I Do? Becoming a great marketer has truly never been easier. The number of resources out there that can help you get better is huge for just about any industry you can think of. Post a job listing on a site that’s relevant to your industry. I haven’t had great success with the signal-to-noise ratio on the broader job listing sites, but the ones more targeted to us⁠—in our case, WeWorkRemotely is a great fit⁠—have resulted in some really strong hires. No matter how much product you can produce, ultimately, someone has to sell it. Whether that’s you or someone else is going to depend on your bandwidth, expertise and how you’d like to spend your time. But the good thing is that you have two options that, if done well, can both be very successful. 9) How Do You Manage Your Time? I procrastinate from time to time (and get mad at myself for it) just like everyone else, but I have found a few strategies that help me accomplish what needs to get done. Power-blocking “repetitive” tasks: answering emails and support tickets, calling customers, anything else where I can batch things, I do. Answering emails one-by-one when they come in is a massive distraction, so I do my best to avoid it. Having a “hard stop” at the end of each day. Pick a time⁠—say, 6:30pm⁠—after which (barring exceptional circumstances), you’re not answering emails, looking at your phone, or doing anything that feels like work. You’re not just avoiding it; you’re not allowed to touch it. Knowing that that hard stop is coming gives you a sense of urgency during the day to work more efficiently, and also helps with work/life separation if you’re often working from home, as I am. Time management is something that even productivity “gurus” I know struggle with, and I suspect that for many of us, it might always be a struggle. Still, applying a few key strategies has helped me immensely, and I hope they help you, too. 10) Should I Quit My Job to Pursue My Startup Idea? This is an issue that a lot of future entrepreneurs grapple with. It’s a tough one, and a deeply personal one. Without knowing details about your business, your job, your personal life and your finances, I can’t really give you an answer. But in every in-depth conversation I’ve had with people considering quitting their job, the wisest decision is “no” as often as it’s “yes.” And if you’re just now beginning to consider the prospect, it may be too early. It comes down to thinking very carefully about why you’re thinking of quitting your job, and considering the other options. Quitting your job is a hugely drastic move. So, why do you think it’ll help? If it’s because you think you need more time…well, are you spending every waking minute outside of your job working on your business? And if not, try that first and see what that does to your growth. Think hard about your motivation, and see if there’s another way to accomplish your “next step” goal while staying in your job. Despite the glorification of going all in, keeping your business as a side project until it’s validated and has some traction can be a smart move in many cases. Are you prepared, financially and mentally, to work for 6 months (or more) without any income? If you have a spouse or significant other, are they prepared for that, too? Are you okay with the possibility of being back to square one in 6 or 12 months, except without the security of a job? I like to mitigate risk as much as possible, and there’s a lot of risk involved in jumping ship this early on in your startup journey. I’d put in every hour that you can getting your company off of the ground, doing customer development and building your prototype. But unless you can justify the leap without hesitation… until you can’t RESIST the leap… I’d likely do it on the side. For now. What burning questions on business, startup growth, marketing, remote work (or literally anything else) can I answer for you?